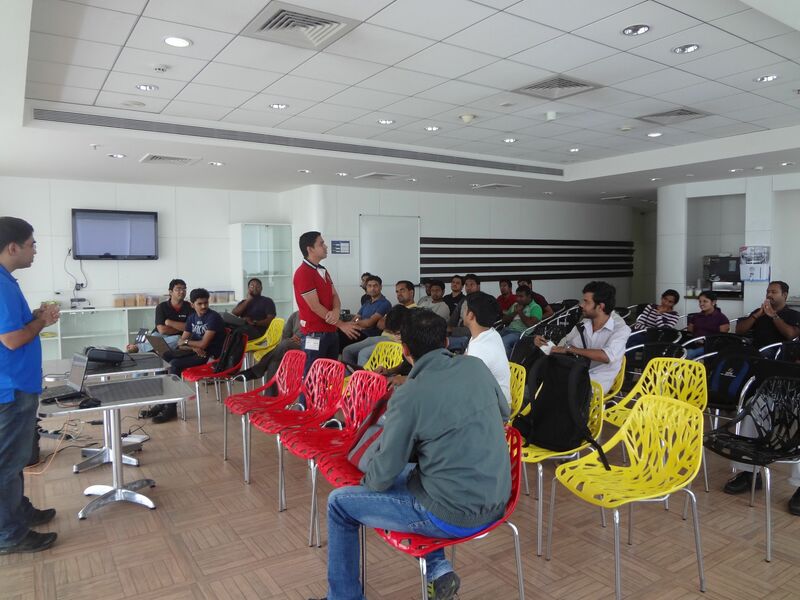 We had second Bangalore Docker meetup @ Red Hat Office on 22nd Feb’14. ~65 people registered for the event though only 40 – 45 people turned up, which I think is pretty good. We started the session with a round of introduction from everyone. Not many attendees used Docker before, so I hope the sessions were help for them. Vijay Bellur started the session by giving an overview on of Red Hat and Docker and how Red Hat is planning to integrate Docker with GlusterFS, OpenShift Origin and RDO (Red Hat OpenStack). Venky Shankar then gave quick and nice Demo. He covered basic Docker commands like how to get the image, start a container, commit it etc. After Venky’s talks Gawtham Sadasivam shared his experience to create a docker file. Last session was from Devashish about setting up logstash inside docker. At the end we had some snacks and open discussion. Thanks a lot for Docker team for sending Docker T-shirts for speakers and stickers for everyone. I hope everyone learnt something new during the meetup. Hope to have next meetup soon.